The lack of vehicle documentation law uniformity from coast-to-coast has led to practice known as title washing. Title washing helps car owners remove their vehicle’s “salvaged” or “flood-damaged” branding. Imagine that you own car dealership stuck with a lot full of flood-damaged vehicles. 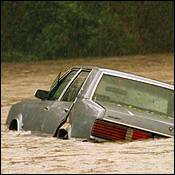 This is exactly what happened to many new and used car dealers following hurricane Katrina. When you include the cars and trucks owned by individuals throughout the Gulf states estimates of losses approach 500,000 vehicles. Would you knowingly purchase one of these vehicles? Few would and that’s why incidences of title washing rise after major disasters like floods and hurricanes. Title washing hides the history of a vehicle that’s been salvaged. Salvage titles are assigned to cars that are deemed a total loss by insurance companies. This is also referred to as “branding” a vehicle. This doesn’t mean the car can’t be driven but vehicles branded with salvage titles have lower market values and are difficult to sell. Title washing washes away a vehicles branding. Once the branding is eliminated, the car’s value goes up and it’s a lot easier to sell. You can see why so many car owners might be motivated to “wash” their titles. Title washing allows dealers and individuals to remove salvage branding from car titles to minimize their losses. Titles are washed by transfering a salvaged vehicle to a state that doesn’t recognize the brand. When the state issues a new title, it may no longer show that it had been salavaged. If not, the seller will move it from state to state until the branding is gone. When it is, the vehicle’s history will have been “washed” clean. Title washing is a dirty trick but consumers can do an AutoCheck or CarFax VIN Check which track a vehicle’s history even if it’s moved to another state. Once a vehicle has been branded and that information is reported to AutoCheck, it remains in their records no matter how many states it’s sold in. The title may no longer indicate severe damage, but a vehicle history report will. “Washing” a title doesn’t wash away computer records. Keep in mind that title washed vehicles are sold by individual sellers as well as car dealers. Don’t assume that because you are purchasing a car on a lot that it’s title hasn’t been washed clean. If you can, obtain a title guarantee from the dealer in writing. This shouldn’t be difficult if the seller is a reputable dealer. If you suspect a local car dealer is committing fraud by knowingly selling a flood car or a salvaged vehicle as a good condition used car, contact your auto insurance company, local law enforcement agency or the National Insurance Crime Bureau at 800-TEL-NICB. I purchased a truck that Auto Check shows was reported at a PA auction as having frame damage, but the Carfax report from the selling dealer in Ohio does not disclose this. Could this be fraudulant? Did the Ohio dealer have the Carfax already printed and ready for you? I have run into several cases where dealers have printed out the reports and then edited them to omit the parts they didn’t want seen. They would gladly hand you a copy but wouldn’t simply go to the Carfax website and print you one from there. CarFax in reality ruins the resale value of a LOT of good cars. For example, a car with only 50,000 miles gets moderate hail damage. The insurance deems it over 60% damage and the report will be “Total Loss”. This vehicle may even end up with a salvage title, over cosmetic damage. Meanwhile, a rental car across town gets rolled over crushing the whole side of the car and roof. No police report. Guess what, rental car companies are self insured! Car ends up at the auction with a clear title and perfect history. Fallacy of the system. It’s buyer beware as it’s always been. I bought a traverse 2 hrs ago. I went to trade it but the car fax says it’s savage. I didn’t know that, what can I do the title doesn’t say is savage. Please help I still owe $11,600.